Tuck Everlasting's never going to be my cup of magical realism, but I've got to admit, it's an awfully pretty thing. And it's also nice to see a story about regular people struggling with the ups and downs of eternal life for a change instead of another bunch of hot vampires. Here's how it all plays out: A long time ago every member of the Tuck family drank from a hidden forest spring and became immortal, but each one is forever stuck with all the tropes of their frozen age. The parents manage middle-aged ruts and middle-aged spread and snoring marital monotony. Lost love burns like it only can in youth. Teen angst and pimples also last forever. Neighbors also tend to notice when you never age, so be careful what you wish for, and all that. Life gets even harder if you're essentially decent folk who know what could happen if people who aren't decent folk ever get their hands on a spring of eternal life. People like the mysterious Man in Yellow who blows into town with the carnival, chasing rumors of magic and mystery. So what's an unkillable clan to do when a charming young runaway like Winnie Foster stumbles into the family's life and onto its secrets? 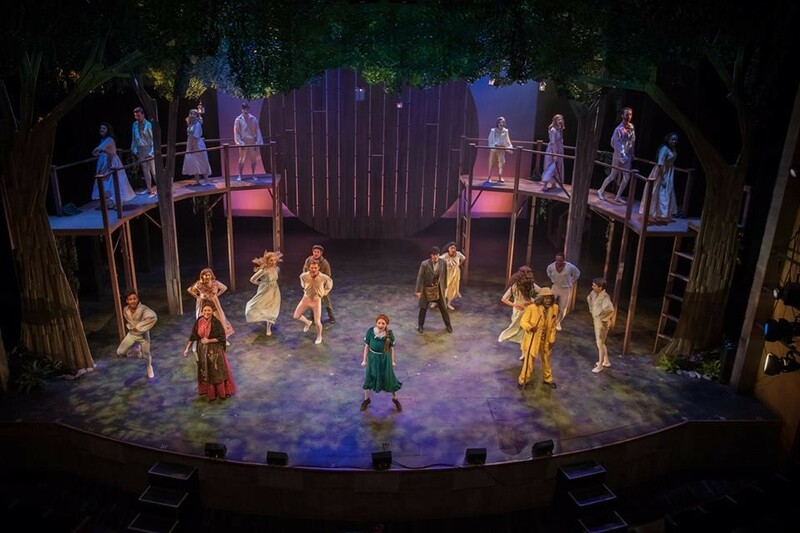 Tuck Everlasting is too much like Playhouse on the Square's favorite and most frequently revived show, Peter Pan — with actor Curtis C's flamboyantly malevolent Man in Yellow filling in for Pan's flamboyantly sinister Captain Hook. Both musicals tell the story of strong young women who ultimately reject immortality and a magical life outside of time and decay. Only Tuck abandons all of Pan's high flying fairy mayhem, swashbuckling pirates, and general sense of deviltry for mundane concerns and long conversations about the meaning of life and death, with lyrical dance passages illustrating the same. Is Tuck Everlasting magical enough to make a good fairy tale? Maybe not. Nobody flies or spins flax into gold. A deep sincerity undercuts the story's Twilight Zone-like ironies, and conflicts never test the play's subjects enough to pass for allegory. The musical's songs are almost instantly forgettable, and the book's more sweet than convincing. 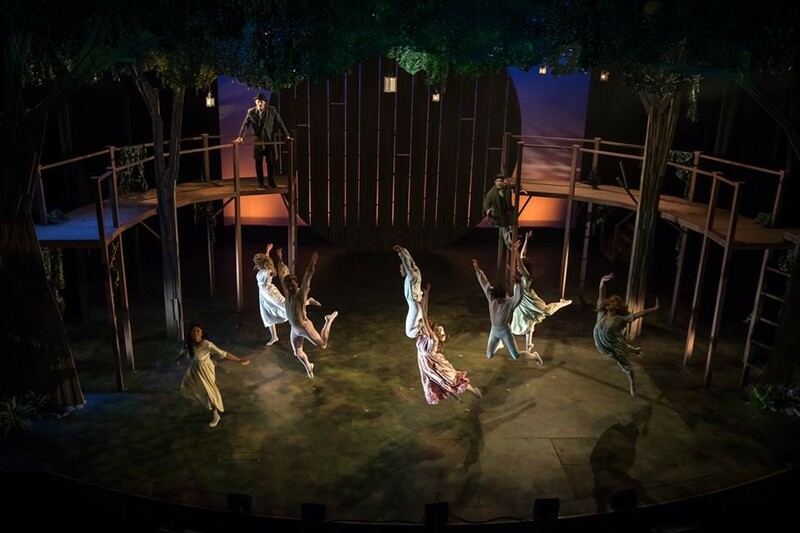 But director Dave Landis has assembled a terrific cast and his design team has outdone themselves, building a world of green parsley stalk trees and purple "magic hour" skies, where a big round sun is eternally stuck in the rising position. Or the setting position, hard to say. Gia Welch's voice has never sounded as rich or full or uniquely hers as it does in this show. If you've read previous previous reviews of the young artist, you'll know that's no small compliment. Even though she's a little too old to convincingly pass for an 11-year-old, her performance as Winnie is never anything short of winning. Welch leads a tight, talented ensemble of local favorites, including Michael Gravois, Lorraine Cotton, and Kent Fleshman. Even if you don't emerge from the theater able to remember the words to any of Tuck's songs — a distinct possibility — these voices follow you home. This is the part of the review where I remind readers that I'm not not the target audience for most family musicals, and Tuck Everlasting's no big exception. The show presents like a philosophical meditation on the meaning of life then opens and closes like a Hallmark card with no personal inscription. Thankfully, POTS' creative team has built a production so lush and lovely it's easy to watch and listen to even if you can't bring yourself to care about any of the characters or what they choose to do with their time, magic water, and pet toads.